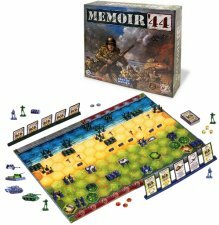 Memoir '44 is a unique historical game where players command a horde of little plastic Army men facing-off in dozens of World War II battles on an oversized hex game board. Each battle scenario mimics the historical terrain, troop placements and objectives of each army. Deploying forces through a variety of Command and Tactic cards, the smart commander uses the unique skills of their units - infantry, paratrooper, tank, artillery, and even resistance fighters - to it's greatest strength. From the cliffs of Pointe-du-Hoc to the hedgerow battles in the Corentin Peninsula and beyond – Memoir '44 airdrops you into the key battles that turned the tide in Western Europe during the summer of 1944. Omaha Beach, Pegasus Bridge, Operation Cobra... Step in and command your troops on the battlefields that defined History in the 20th century! Easy to learn and fast-paced, Memoir '44 requires strategic card play, timely dice rolling and an aggressive, yet flexible battle plan to achieve victory. From the cliffs of Pointe-du-Hoc to the hedgerow battles in the Corentin Peninsula and beyond -- Memoir '44 airdrops you into the key battles that turned the tide in Western Europe during the summer of 1944. Omaha Beach, Pegasus Bridge, Operation Cobra... Step in and command your troops on the battlefields that defined History in the 20th century! The game has a double-sided, three section board map of the battlefield, featuring beach landings and countryside terrain. There are 44 lavishly painted double-sided terrain hexes, along with the 3D miniatures and obstacles to go on them. Also included are 60 Command cards, including 20 WWII Tactics cards and 40 troop movement Section cards, and two Army bags of incredibly detailed miniatures. You also get a cardholder to share with your "command staff" and some time-saving Terrain summary cards. A new double-sided Battlefield board for Memoir'44. Featuring frozen expanses on one side, desert ones on the other. Also includes a simple set of Campaign rules to link scenarios together and Blitz rules for Early War conflict.